Valentine’s Day conjures up all sorts of emotions in the life of a single person. From dredging up memories of crepe paper shoeboxes in the classroom to reflections on the last relationship gone wrong, it’s hard to look forward to a holiday hell-bent on canned sentiment and the rather public pronouncement of your status as single. While reflecting on what is wrong with a holiday dedicated to lovers can leave one bitter, it’s also an opportunity to celebrate what is so right about singledom. The best flowers to do this with are sweetheart roses. Small but mighty, these sprays of gorgeous rosebuds will help you count your blessings for being with the one person who knows you best and loves you for who you truly are- you. Sweetheart roses, not to be confused with miniature roses, are a smaller variety of the traditional hybrid tea rose. They are delicately shaped on stems that can be a foot or more in length and often have several blooms, giving them another common name, spray roses. Selectively bred for this smaller size and multiple blooms, these roses have become very popular in recent years and new colors and cultivars come in almost every color of the rainbow. The petite “La Belle Pink” is a gorgeous two-toned shade of pink fading to green and the unique “Hocus Pocus” cultivar is so red it is almost black. Almost every florist will have a variety of colors from white to yellow to deep red on hand this Valentine’s Day for you to choose from. Compared to the longer-stemmed roses, the sweetheart roses will be sold in a bunch for much less, but will last just as long in a vase at home. 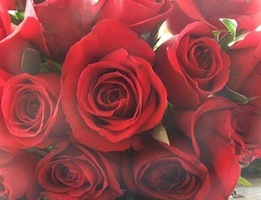 Like all roses, the scent of the sweethearts are alluring and fresh. They hold up well for more than a week and can be dried by hanging upside down. They look great on their own in a short, round vase, or mixed with some fluffy alstroemeria to fill out a larger one. In the Victorian language of flowers, the sweetheart rose is said to symbolize love and devotion. While we can be one of our own toughest critics, it’s also important to be your own admirer. Just like in a relationship, it’s important to demonstrate your admiration through kind words and deeds, and few things feed the soul more than flowers. Perhaps this Valentine’s Day, you can start a new tradition that will last the whole year of bringing home a small bouquet of blooms. The petite petals of the sweetheart rose are a small way to pay yourself a big complement this Valentine’s Day.